CSKA Moscow finished its 2016-17 Turkish Airlines EuroLeague season in third place after defeating Real Madrid 94-70 at the Sinan Erdem Dome in Istanbul Sunday, ensuring last year's champions CSKA the league's overall best record for the season at 26-9. 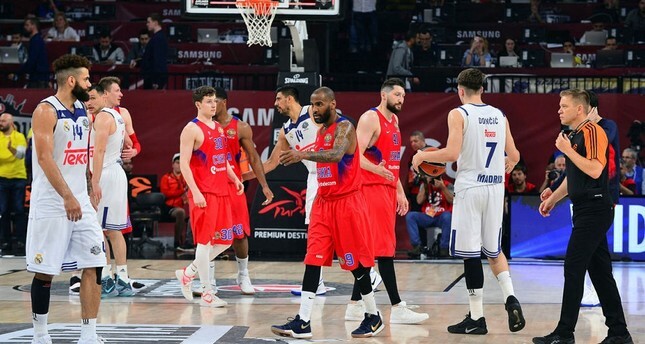 Free throws by Fridzon and a triple by Teodosic carried CSKA's lead to 28-14 midway through the second quarter, followed by Felipe Reyes' three-point play and Dontaye Draper's triple. Real Madrid's Ayon and Andres Nocioni led an 8-0 run, however free throws by Nikita Kurbanov and a three-pointer by De Colo put CSKA ahead 45-32, at halftime. With Higgins and Teodosic's help, De Colo kept CSKA rolling at 53-67. After Fridzon's another three-pointer early in the fourth quarter and a boost by Vorontsevich and James Augustine, CSKA led 76-60. Jackson scored a triple and struck again to seal the outcome at 67-84 with over three minutes left. Later on Sunday, Istanbul giants Fenerbahçe will play against Greece's Olympiacos in the final match of Turkish Airlines Euroleague Basketball. The cup was a near-miss for Fenerbahçe when CSKA Moscow secured a narrow win last year, but the Istanbul club aims for its first cup in the tournament it manages to reach the Final Four for the third time in a row. The Yellow Canaries count on Bogdan Bogdanovic and Ekpe Udoh, who made it to the list of the top five players in the Euroleague. Bogdanovic boasts 14.5 points average while Udoh has a 12 points average for the season. On assists, Fenerbahçe's most prolific player is Greek guard Kostas Sloukas with 4.6 assists average.